Ansari made the remarks during the launch of a book -- 'The Sarkari Mussalman' by Lt Gen.(retd) Zameer Uddin Shah, who had led the Army Division that quelled the Gujarat riots in the state. 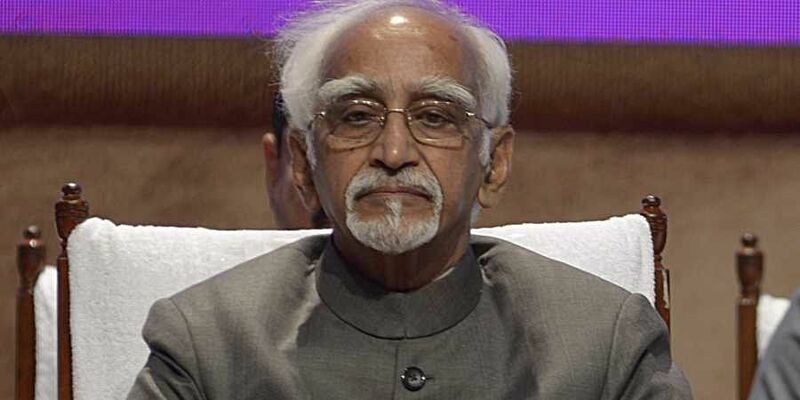 NEW DELHI: Referring to the 2002 Gujarat riots, former vice president Hamid Ansari Saturday asked why was Article 355 of the Constitution not invoked by the then Union government even when its defence minister was on the spot. The former vice president also said there were "no military solutions to insurgency" as normalcy can be restored only by winning the hearts and minds of people. "'The initial reaction of the civil administration was tardy; curfew had been ordered but not enforced; no attempt were made to convene peace committees and attitude of police was partisan'," Ansari quoted some of the observations from Shah's book on the riots. But, the former vice president observed, that the book was silent "about the role of the political leadership". "If the civil and police administration fails to respond to a massive failure of law and order, where does the responsibility rests in a democratic and parliamentary system," he asked. "Why was Article 355 of the Constitution that makes it a duty of the Union to protect a state against internal disturbance not invoked even when the Centre had the benefit of Raksha Mantri on the spot?" he asked. Article 355 pertains to 'duty of the Union to protect states against external aggression and internal disturbance'. The reportage of Gujarat happenings in the national and international media was extensive and even the NHRC took note of it, he said. "In an interview to a Malayalam weekly in 2005, former president K R Narayanan had revealed his remonstrations with the government and observed, and I quote (Narayanan) -- 'Military was sent but not given the power to shoot. And, there was a conspiracy involving the central and the state government behind the Gujarat riots'," he said. The book has kicked up a controversy, alleging that transport and other logistics support "arrived a day later" for the army troops that had landed in Ahmedabad after communal riots broke out in the state. Lt Gen.Shah, at the function, said he had met then Gujarat chief minister Narendra Modi and then defence minister George Fernandes at the CM's residence at 2 AM on March 1 and sought transport and logistics support. "But, the transport rolled in only on March 2," he alleged, adding "hundreds of officers from my formation can speak on that, and there are war diaries of the battalion". However, Jasim Mohammad, director of Forum for Muslim Studies and Analysis, Aligarh, has countered the claims made by Shah in his book about the role of the then Gujarat government. "Shah's claims in the book about the then Gujarat government is wrong. He had met Prime Minister Narendra Modi in March 2016, where I was also present and Shah Sahab had praised Modi for providing support to the Army in 2002 as the chief minister," Mohammad claimed, adding, "how can these both things be true a the same time". On Friday, Mohammad had even written a letter to Ansari, urging him not to attend the book release function. The event at the India International Centre was also attended by Shah's brother and actor Naseeruddin Shah.